Who is Brock Doors and Windows? While the style of your patio doors is important, the features and functionalities should also play a vital role while deciding which are the best fit for your home. For some homeowners, outdoor spaces are accessible to the public which is why finding patio doors with reliable security hardware is so important. You will also want to take into consideration the amount of space you are working with when choosing the type of doors you want to incorporate into your home. If the doors swing in or out, you need to think about available floor space and furniture placement. If floor space is minimal, a sliding patio door may be a better solution! Patio doors are an excellent way to blend together your indoor and outdoor spaces. If you are the type of homeowner that enjoys entertaining outside, you should pay special attention to those doors that allow you to easily move in and out of your home. Well placed patio doors are also an ideal option for those looking to show off an impressive view. The right patio doors will expand a space, create a welcoming tone for guests, and allow the right amount of fresh air to enter your home. 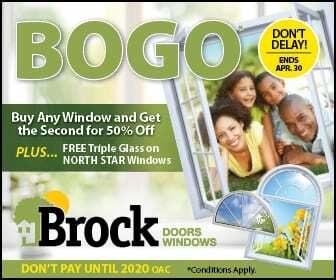 Although, there are many different materials on the marketplace, Brock focuses on the superiority of vinyl patio doors. Vinyl patio doors are beautiful and very affordable. Our manufacturers use only the finest, most durable PVC which creates a door that is long-lasting and maintenance free! Vinyl will not rot, peel, rust, or crack, so it will stand up to the elements and still look great! In our patio doors you will find unsurpassed quality and craftsmanship that you will be proud to add to your home. At Brock Doors and Windows, our window and door experts are ready to introduce you to a wide variety of patio door options and help answer any questions you may have. Our team will even provide you with a free quote, so you can know exactly which type of patio doors in Toronto, ON work best with your personal budget. To receive your quote give us a call at 1.800.449.3808 or visit us at one of our two store locations to view your options in person at 278 OrendaRd.Brampton, ON L6T4X6, Canada or 2131 McCowan Rd, Scarborough, ON M15 3Y6, Canada.